Terry Rozier is off to a great start this season. His averages thus far are 23.0 MPG, 12.0 PPG, 2.0 three pointers/game, 5.0 RPG, 4.0 APG and 3.0 SPG.. He is shooting 44.4% from the field and 50% on three-pointers. And he has absolutely zero turnovers over the course of the two games. That stat and his three steals per game are terrific. For those that get bored quickly by numbers, just know that a player high on the chart is defensively effective, and a player far to the right is offensively effective. High and right means good in both. Now just skip this paragraph and the next two. For those that stayed, let me explain the chart below and why Terry stands apart from his team mates. 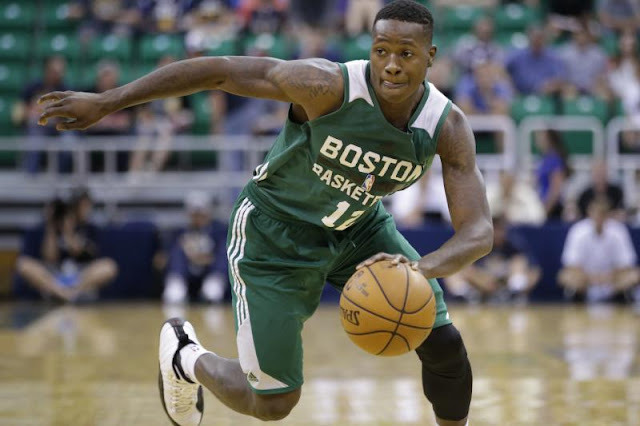 Terry Rozier has zero turnovers through his first 46 minutes this season. Only turned the ball over three times during 81 minutes in the preseason. Oh, and just 10 TOs in 277 postseason minutes last year. According to NBA Math, total points added (TPA) rely on three factors, defensive and offense effectiveness and playing time. The chart is in the form of a graph. Offense goes right-to-left and defense goes bottom-to-top. The best offensive players are far right, and the best defensive players are at the top. Since we are dealing with effectiveness, playing time is also added into the equation. Rozier sits at the far right (offensively effective) and just about even with Marcus Smart, and slightly below Al Horford, on the vertical defense scale (defensively effective). We are only dealing with numbers right now, but that tells us a lot about Terry's overall effectiveness for the team. The chart shows graphically how Rozier stands apart, in a good way, from his team mates. He is ahead of everybody else on offense, and he is Marcus' equal on defense. Pretty amazing. If a player is close to the vertical line, it means he is rated average on offense. That would be Horford as an example. Being near the horizontal line means a player is average on defense. Aron Baynes had his head bisected by the horizontal line, so he is absolutely average on defense, according to NBA Math. There is a cluster of players near the cross-hairs, so they are rated near average in both categories. Former Celts Mark Blount (remember him?) and Greg Kite might be off the chart to the lower left. Sorry, too much math. So, in general what is wrong with this picture? Terry is lonely in the upper-right (preferred) quadrant. He needs company. He is the only Celtic to be above average in both categories. The good news is that no player is even close to joining Kite and Blount in NBA Math Limbo. If possible, I will track these charts over the season and see the player movement. But it is amazing that Rozier is almost off the chart in a good sense. It does need to be put into context, though. NBA Math constantly alters the manner in which they calculate the factors that determine final numbers. The factors in this case would be offensive points added (OPA- bottom of chart) and defensive points saved (DPS- left of chart). This is not a perfect system, and they know that. I found the chart interesting and informative, but I still go back to Terry's stats from the first two regular-season games, and I really like what I see. He should see 24-28 minutes a game as one of the first players off the bench. With a few more minutes playing time, we could be seeing Smart-like lines, only with more points and better scoring efficiency. Plus equivalent defense. Marcus' rebounding thus far has been exceptional, so Rozier may not equal that stat. On a League-wide basis, Rozier sits at second place behind Lebron James. Pretty Impressive. Terry has the potential to reach Avery Bradley's level on both offense and defense in less time than was required by Avery. That could happen this season. The timing could not be better.